Only once while camping have I feared for my life. Once was enough. I was alone in a secluded campsite with my two sons, and I was unarmed. But that's getting ahead of my story. 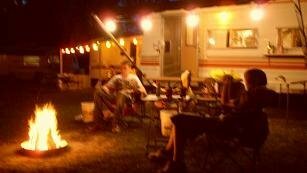 Before we had our beloved Shasta camper trailer, we camped in a roomy tent from Columbia (the sportswear experts). We camped in state parks because we liked the grassy, shaded sites and the small amount of privacy afforded by the wooded layouts. It was quiet at night, peaceful. Falling asleep to the sound of crickets and cicadas was heaven. 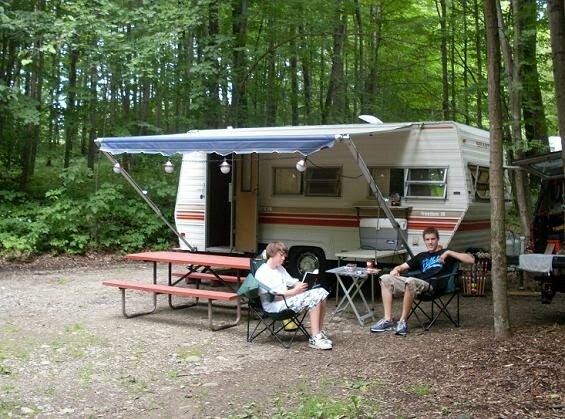 Our favorite campground was at Hamlin Beach State Park, on Lake Ontario. The place is beyond huge. We often wondered how much the maintenance crew spent fueling up the lawnmowers. Hamlin has room for a couple hundred campers in a series of loops. We settled, eventually, on a campsite deep in the heart of C-Loop as our regular spot. That put us nearly a mile from the campground entrance point, and far from the noisy pets-allowed loops up front. The loops were paved, so we could roller-blade and ride our bicycles all around the place. We had a reasonably flat, grass-covered and tree-canopied spot. Since there was no site directly across the driveway, it felt as if we were the only ones camping there sometimes. We often camped as a family, but sometimes it was just me and the boys. It was a chance to get away and have some guy-time, just kick back and enjoy each other's company. That was the case on the scary night in question. I woke up around two am. Somewhere nearby, a man was yelling. 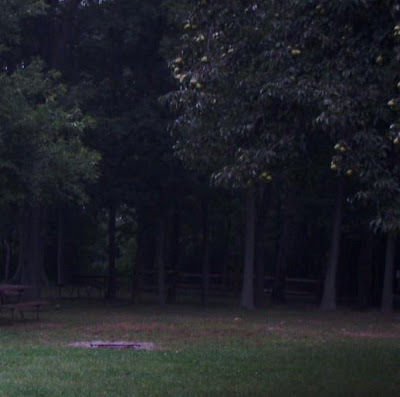 Nobody yells in a state park in the middle of the night. Nobody even plays easy listening music after 11 pm. The rest of the night world was so still you could hear an owl a half-mile away. It probably took a moment or two for my brain to accept what my ears were hearing. I don't think I missed much. Just across the driveway, in another site screened from the road by bushes, someone was extremely unhappy with someone else. The yelling got louder; the language being used was unprintable. Gathering the story at full volume while I struggled to pull on some clothing, it seemed that there was a woman, a man, and an extra man. The word kill was part of the discussion. Did someone mention gun? I was scared. We were too far from civilization for comfort. It was mid-week, and there weren't many campers around us. Things were getting very ugly over there, as love triangles often do. The sound of the entrance zipper sounded like a chainsaw to me, as I eased out of the tent to get my cell phone from the truck. I prayed my boys wouldn't wake up. Something glass got smashed, and a woman screamed. More yelling, more furious threats. Shaking, I eased the truck door open and pushed the no-lights button at the same time, grabbed my phone, and pecked at the keys for 9-1-1. The confrontation escalated while I tried to whisper my urgent request for help. Try explaining where you are by Loops and Site Numbers. At least the dispatcher never once questioned the situation. It seemed like hours later, but couldn't have been more than five minutes, before the troops arrived with spotlights and real guns. I imagined a burly officer coming over to get my testimony or something, but that never happened. They lit up the campsite over there, had some gruff exchanges which I strained to overhear, then one by one departed the scene. The boys never woke up. They were wide-eyed when I told them the story of the night's events that morning. I can't be sure, because it's been a few years now, but I don't think we ever stayed there again. I like my campgrounds really crowded now! How about you? Do you have a camping nightmare story you'd like to share? You can reach me via Comments or by using the link at the top of this page. I spent a night with two of my college friends in the Kiamichi mountains in southeastern Oklahoma one weekend. I don't remember what time it was, though I know it was past midnight, but a feral hog plowed right into my tent breaking my right arm and warranting stitches on my head. It turns out that it was being chased by a pack of bobcats. I've never heard of bobcats hunting in packs before, but I saw them scamper off as we shined the spotlight. The boar never once slowed. Weird, terrifying and funny night. Good story! Our film team has been searching for scary camping stories like this one; glad we found yours (and that nobody was hurt). If you have a moment, we'd love for you to check out our horror-thriller, MOTHER NATURE, about a man and his son on a camping trip that goes awry in the woods of eastern Washington. Might bring back some memories for you! And feel free to write a review if you like it. Always happy to share with our audience! Product reviews: Grill Charms™, no "mis-steaks"!